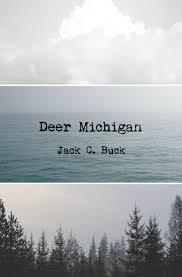 Deer Michigan by Jack Buck is a collection of flash fiction that draws its strength from its cohesion. Unlike the other flash fiction collections that are almost urban in their diversity of character and theme, Buck’s stories feel more like a small town. These stories are a close-knit community of sorts, where every story seems to know the other stories – or at least think they know one another. Ultimately, it is a deeply rewarding read to be savored, with each story offering its own surprises while deepening the sense of place. Right away the stories in Deer Michigan feel like the residents of a town, held together by that connection that comes from a shared place. As the title of the collection suggests, sense of place permeates many of the pieces, where often Michigan and the Midwest play quite a role in many of the stories. Often they are set firmly in a particular place, such as “When the Cubs Win the World Series”. Then there are other broader settings, like the title piece, “Deer Michigan,” an ode to the place of “early fall and long winter”, full of specificity that instantly made me wish I had grown up there. Even those stories set beyond the region feel that they belong, though distantly. Perhaps they, like the character in “Back to the Beginning,” are just residents who have moved away, but who still carry the nostalgia of the place with them. From the beginning, this book has the intimacy of a letter from a close friend. Many stories are written with the second person. In these flash pieces, which tread the line between confession and conversation, the “you” fits. It would be easy, often, to imagine the characters in these stories into a bar. There they might run their fingers over the edge of a pint glass, and catch you watching their reflection in the mirror. There are, of course, more intimate pieces like “Local Weather.” “If I could go back,” the narrator explains “I would ask if it would be okay if I brought over a handheld audio cassette recorder to record the first time we told each other I love you. I would have that audio recording now, and I would listen to that short seven-second clip to hear what it felt like to have someone love you.” (105) The frequent use of “you” does not merely bring the reader closer to the stories, however, it also stretches each narrator beyond the page, deepening the sense of longing that permeates the book. And this simple but powerful sentiment, perhaps, could contain much of the books stories and characters. In the end, Deer Michigan reads like a collection of poems, not because of a focus on language but in this longing. As the double meaning of the title suggests, the book is almost like a love letter: to mistakes, to nights sleeping on rooftops, to a future moment where the Cubs win the world series and Lake Michigan turns warm. ← Wigleaf Top 50 and Longlist Honors!